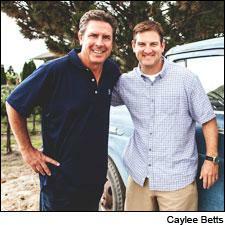 Dan Marino (left) and Damon Huard have started their own Walla Walla winery with winemaker Chris Peterson. • Former NFL quarterbacks Dan Marino and Damon Huard have long been known to Unfiltered as wine geeks at heart. Marino at one time put his name to a charity label, Marino Estates Vintage "13" California Cabernet, which benefited the Dan Marino Foundation for autism research, and Huard, who grew up in Yakima, Wash., was looking to buy a vineyard in Washington with Marino and two other former NFL QBs, Drew Bledsoe and Rick Mirer, as far back as 2003. That deal fell through, and Mirer went on to found the Mirror Wine Company Napa Cabernet label, benefiting the Mirer Family Foundation, which supports numerous children's charities. And of course, Bledsoe went on to great wine success, partnering with Leonetti Cellars winemaker Chris Figgins to make the outstanding- and classic-scoring Doubleback Walla Walla Valley Cabernets. Now, Marino and Huard are taking a cue from Bledsoe's playbook and partnering with another established Washington winemaker, Chris Peterson of Avennia, using grapes from Champoux, Klipsun and Discovery Vineyards, to make Passing Time Cabernet Sauvignon Horse Heaven Hills. They've made 500 cases of the first vintage, 2012, priced at $75 a bottle; it's set to be released in April 2015 but available for pre-release purchase now. • Loco uncles across Madrid celebrate this month as Spain's iconic uncle-who's-had-too-many, Tio Pepe, has been returned to his home in Madrid's central square, La Puerta del Sol, absent for three years but once again ready to get lit. OK, so Tio Pepe may just be a Sherry bottle wearing a jaunty Andalusian hat and leaning on a guitar, but he's been watching over the Puerta since 1958 as part of a historic neon sign for the beloved fino brand from Sherry house Gonzalez Byass. The sign first went up in 1936 to celebrate the bodega's centennial. In 2011, new owners of 1 Puerta del Sol requested it be taken down so that the building could undergo renovation, but the 78-foot-long, 27-foot-tall, 53,000-pound Jerez guitarrera and accompanying Tio Pepe text did not fit the look the new owners wanted, so Tio Pepe was shelved. This did not sit well with Madrileños. Said company chairman Mauricio González Gordon, "The amount of affection that has been demonstrated by the residents of Madrid over the past three years has been quite amazing; we did not fully appreciate how much this neon sign meant to people here in Spain and abroad until it was taken down." Fortunately, the big guy found a new home at 11 Puerto, and after being hoisted up this past month, Pepe now lights up the Madrid night again. • LegalAid of Orange County will be the beneficiary of Celebrity Cruises' first wine festival on solid ground, to be held May 31 at the Great Park in Irvine, Calif. Celebrity has long had its sea legs when it comes to fine-wine appreciation, with 10 of its waterborne restaurants earning Wine Spectator Awards of Excellence for their wine lists, but this will be their first time taking a wine festival, literally, on the road. The Celebrity Cruises Great Wine Festival will feature more than 40 wineries and breweries, including Benziger, Cakebread, Louis Jadot, Jordan and Justin, along with many local restaurants, including Bluewater Grill, Clay Oven, James Republic and more. Tickets are priced at $100 for the 3-hour event, and proceeds will benefit Orange County's LegalAid, which has assisted more than 500,000 people with pro-bono or low-cost legal services since 1958.